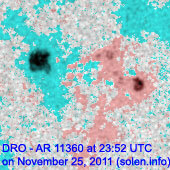 Last major update issued on November 26, 2011 at 08:40 UTC. 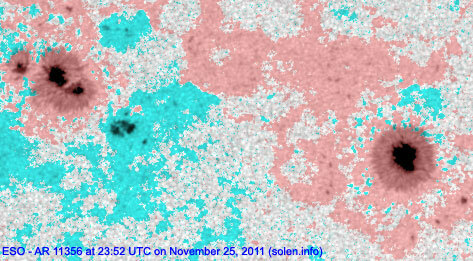 The geomagnetic field was quiet on November 25. 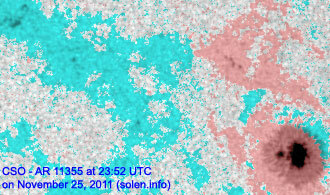 Solar wind speed ranged between 351 and 456 km/s. 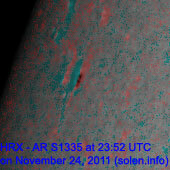 Solar flux measured at 20h UTC on 2.8 GHz was 135.2 (increasing 12.2 over the last solar rotation). 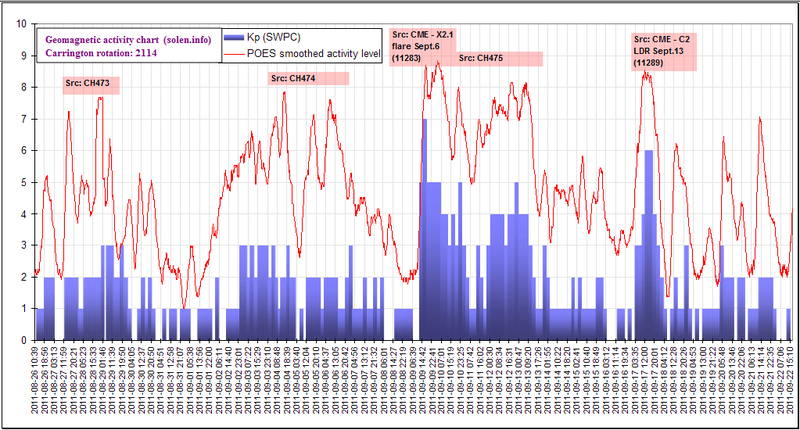 The planetary A index was 4 (STAR Ap - based on the mean of three hour interval ap indices: 3.8). 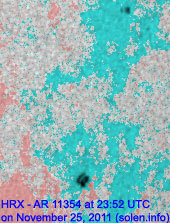 Three hour interval K indices: 22101101 (planetary), 22200211 (Boulder). 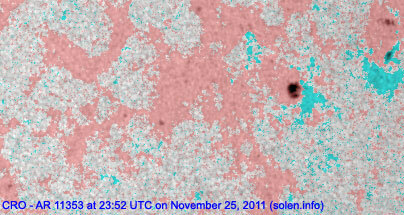 At midnight UTC the visible solar disk had 11 spotted regions (in 2K resolution SDO images). 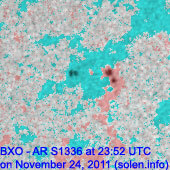 Region 11352 [S24W52] decayed slowly and quietly. 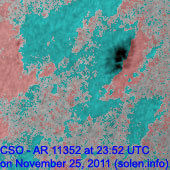 Region 11353 [N09W35] developed slowly and was quiet. 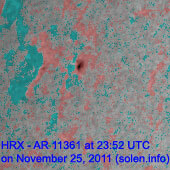 Region 11354 [S15W35] decayed slowly and quietly. 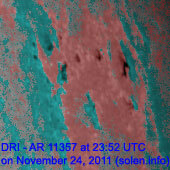 Region 11355 [N15W18] decayed slowly and was quiet. 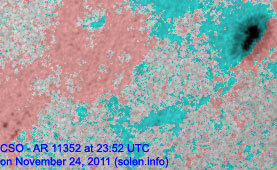 Region 11357 [N18W81] decayed slowly and quietly. 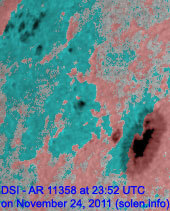 Region 11358 [N20E41] developed significantly adding spots and penumbral area. 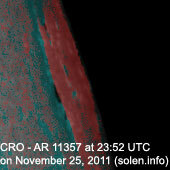 Region 11360 [N18E18] emerged in the northeast quadrant on Nov.24 and was numbered the next day by SWPC. 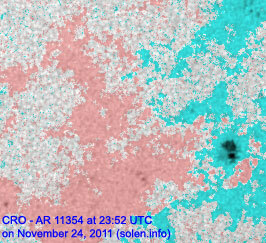 Region 11361 [N20E60] rotated into view at the northeast limb on Nov.24 and got an SWPC number the following day. 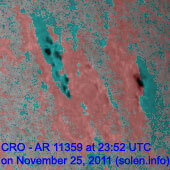 A filament eruption across the solar equator near the western limb was observed beginning at 05:58 UTC on Nov.26 and apparantly triggered a C1 flare. 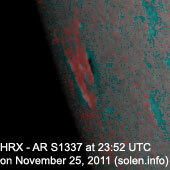 November 23-25: No obviously Earth directed CMEs observed. 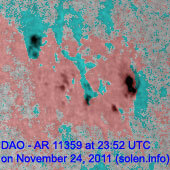 November 22: A filament eruption between regions 11356 and 11355 began near 06:24 UTC and caused a weak partial halo CME as observed by SOHO/LASCO. 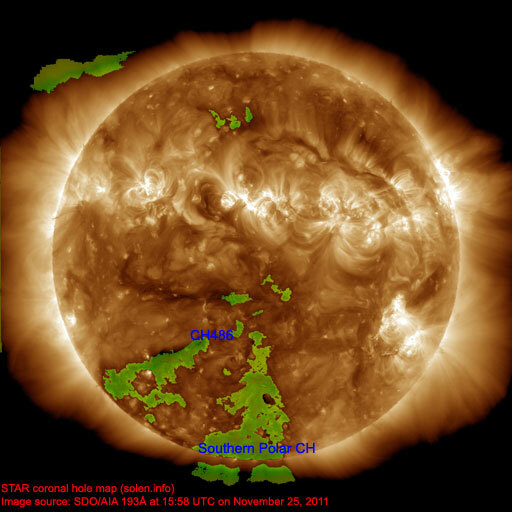 A coronal hole (CH486) in the southern hemisphere will likely rotate into an Earth facing position on November 26-27. 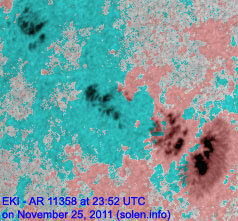 The geomagnetic field is expected to be quiet on November 26-28. 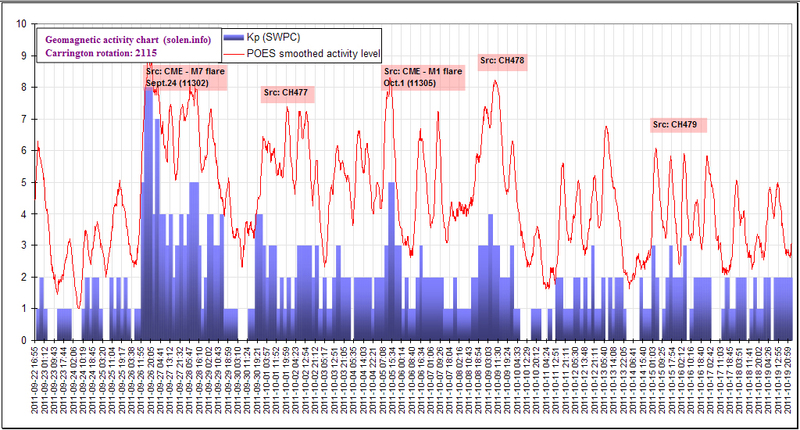 On Nov.26 there's a possibility of weak CME effects from the CME observed on Nov.22. 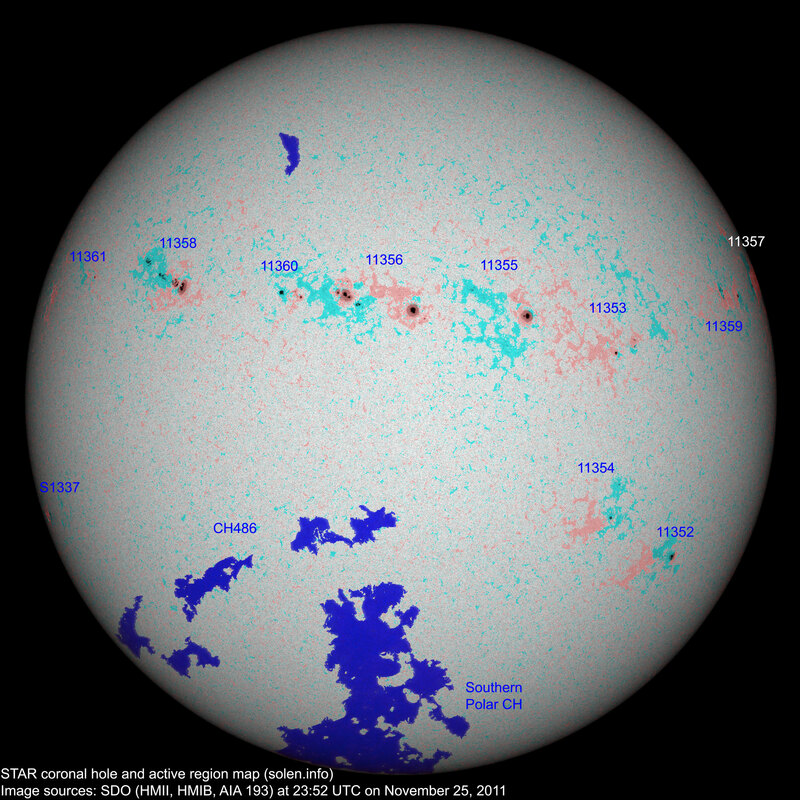 A coronal hole related disturbance could start on November 29 and last until December 1 with occasional unsettled and active intervals.